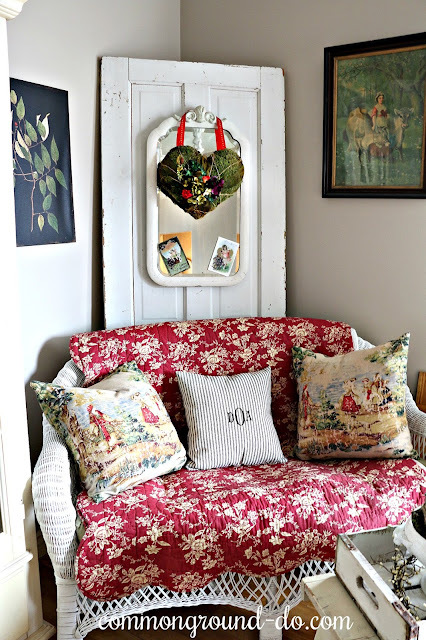 Hi Friends, I challenged my decorating "self" this month to do some Valentine's Day vignettes with pinks and soft pastels instead of a lot of red. No sooner do I put away the reds from Christmas than they're back again for February and Valentine's Day. 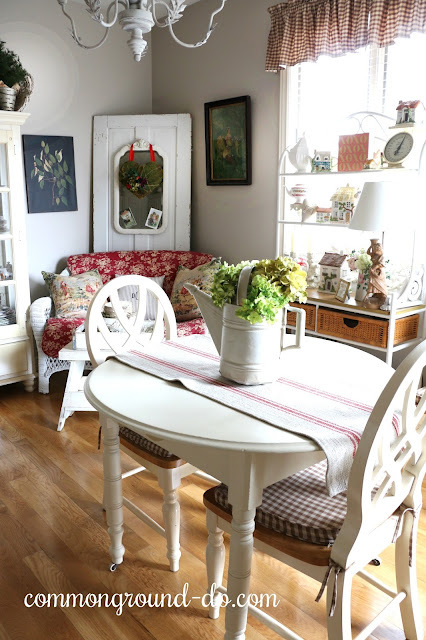 I wanted to keep the Baker's Rack romantic and feminine, so I used my antique china teapots and some of my English Cottages to keep things sweet and homey. 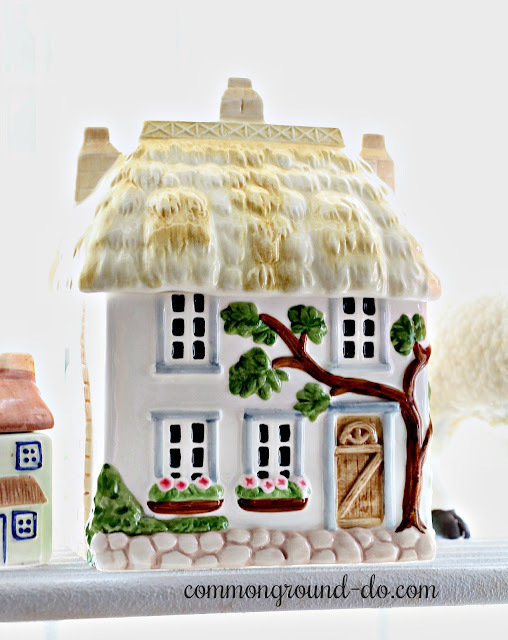 The two smaller cottages are a salt and pepper set. 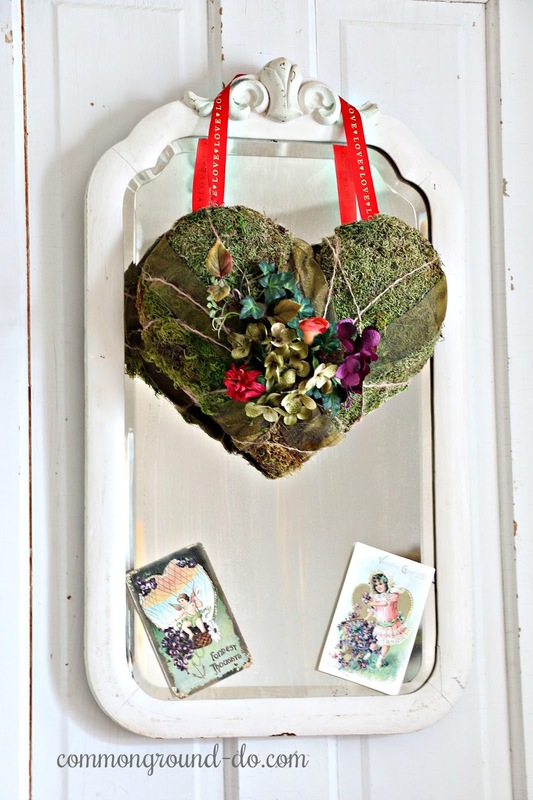 I shared a few of my vintage "Valentine's Day" accessories HERE and HERE last week. 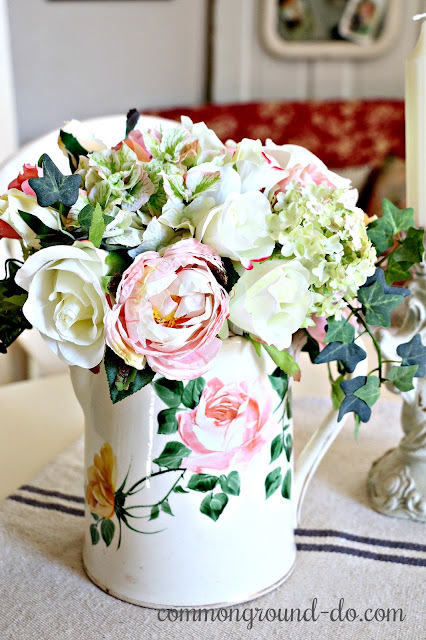 I'm really enjoying my faux rose arrangement in the painted rose pitcher. It's so much easier than trying to outsmart the kitties in their quest for greens and tasty blooms. I do have a little red out and about, but I'm trying to keep it toned down. 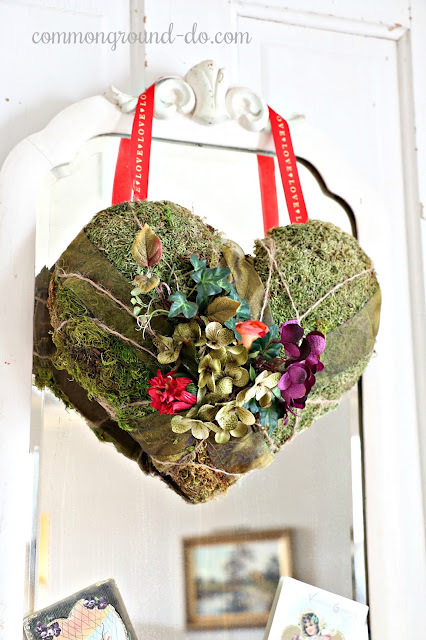 I finally got around to sharing a tutorial on my Moss-Covered Heart this week. I put it together several years ago, but wasn't prepared for the mess I made. Picture taking at that time was out of the question with Tacky glue from head to toe. 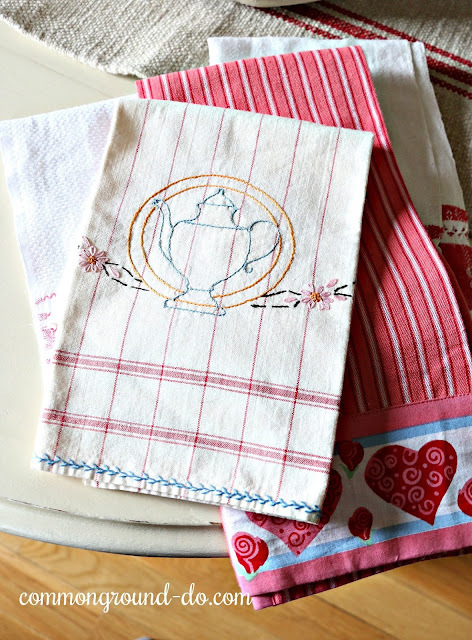 I'm mixing a few vintage tea towels with newer ones. 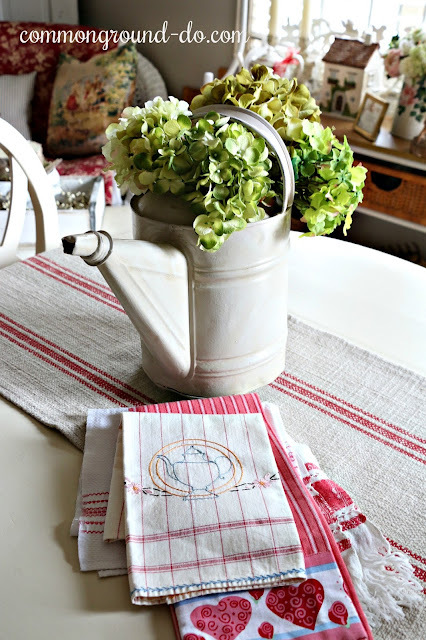 Tea towels are an easy way to bring in some color and add to the Holiday or Seasonal decor. 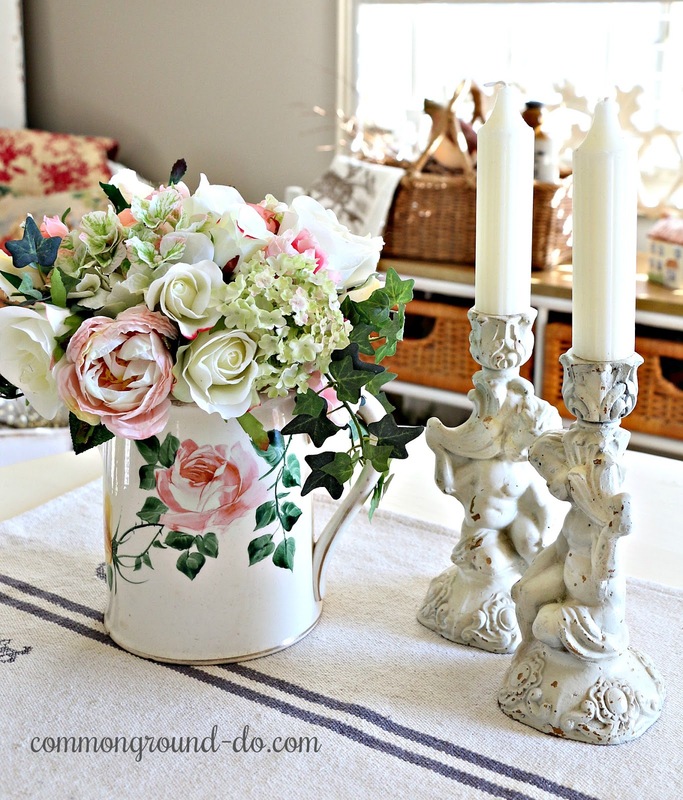 ... and I brought back my little painted watering can some faux Hydrangeas. Two vintage pillows add a little extra Valentine's love. 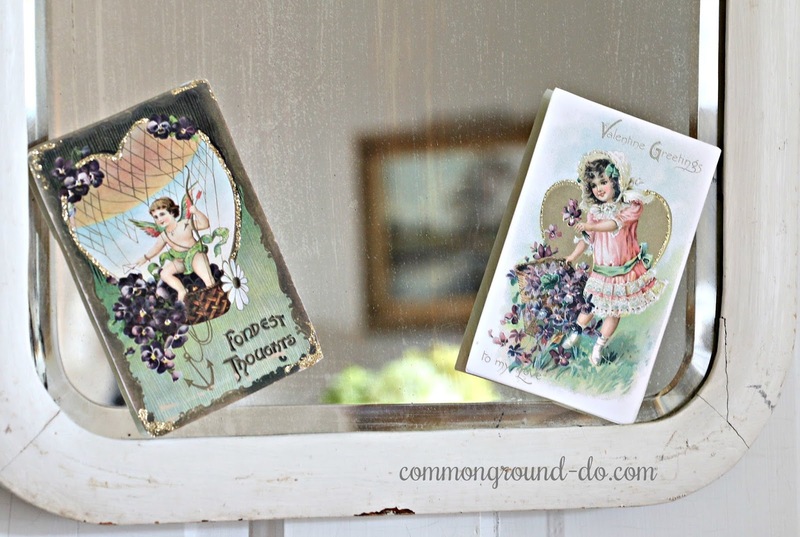 Do you have special plans with your big Sweetie and little Sweeties? Since it's a weeknight I went crazy and made brownies for a special treat. That's really stepping out there for me these days, since we've been cutting way back on sugar around here. They tasted pretty good even if they were gluten free. 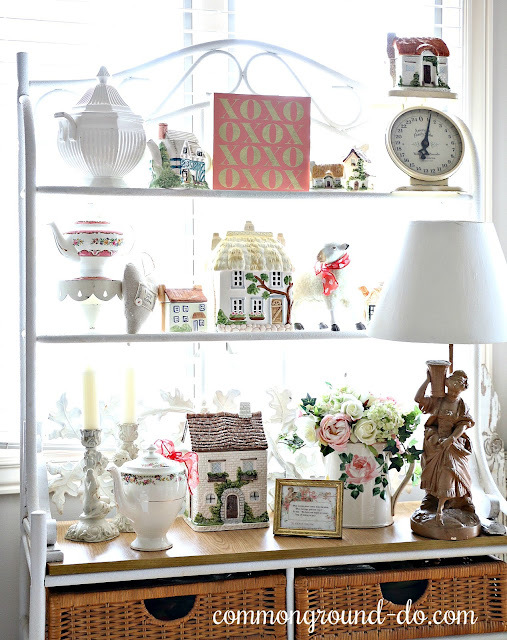 Swooning Debra. Just all so pretty. Always love the way you style your baker's rack. Happy Valentine's Day. thanks Kris, hope you had a wonderful Valentine's Day! 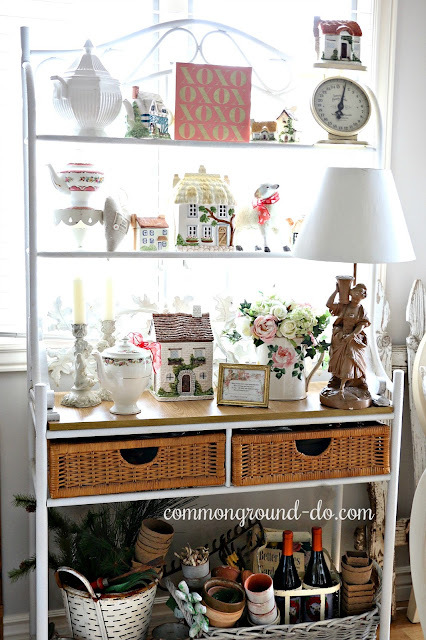 L♥ve the cottage look on the baker's rack! 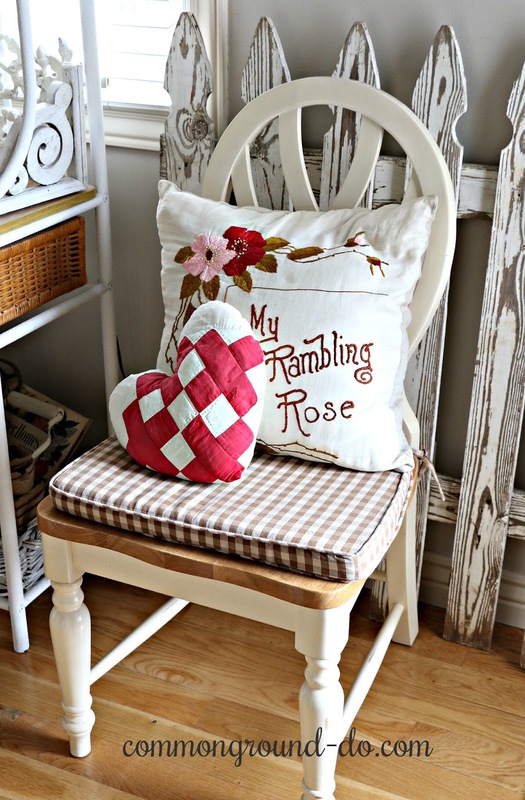 Cute heart pillow and, of course, the vintage towels. We went out for a dinner yesterday, lunch today, and had heart-shaped cream donuts. :) Happy Valentine's Day! oh yum, heart shaped cream donuts? you know how to hurt a girl! everytime I drive by Krispy Kreme my mouth waters. sounds like your sweetie knows how to treat you right! oh, a velvet egg sounds beautiful, I know you'll create something amazing! I was introduced to the antique cottages over 30 years ago when I received a marmalade jar and salt and pepper set as a gift from a friend. 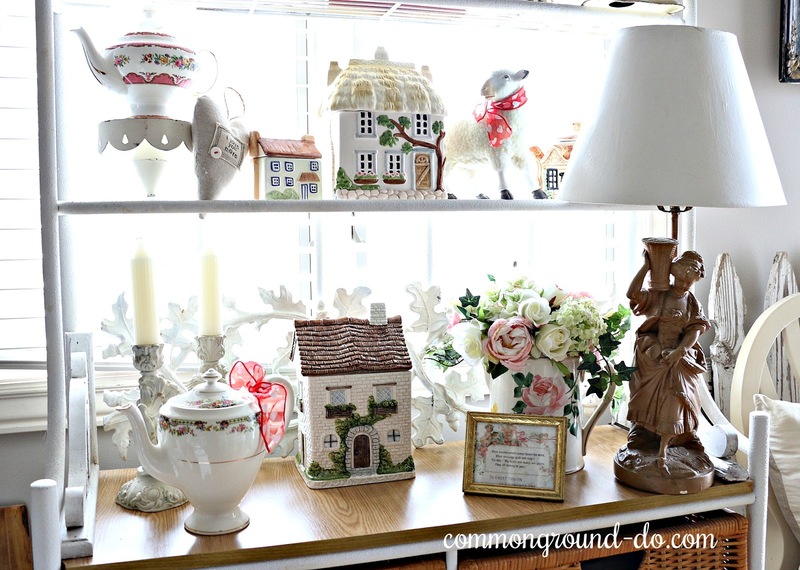 Love your sweet cottage collection and all of romantic vignettes! Hope you had a most wonderful Valentine's Day Debra! 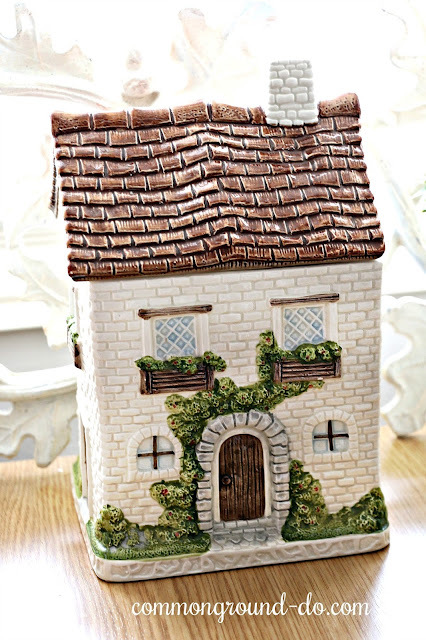 Hi Shirley, yes, that's the marmalade jar that matches the s and p on the little scale! Hope you had a fun Valentine's Day yourself. I'm trying to drag the holiday out through the weekend! I love how you decorated your bakers rack.It is all charming at your home. I love gluten free brownies too! 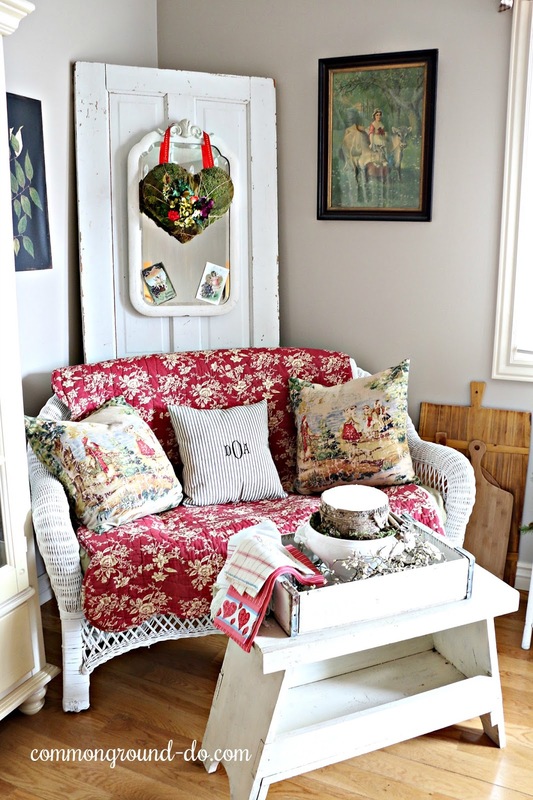 I love your sweet tea towels and the cute little wooden crate. Such loveliness! And what a beautiful blog header you have. Oh my goodness this post is just as lovely as your vintage Valentine blog hop post! I will be featuring you tomorrow at TFT!